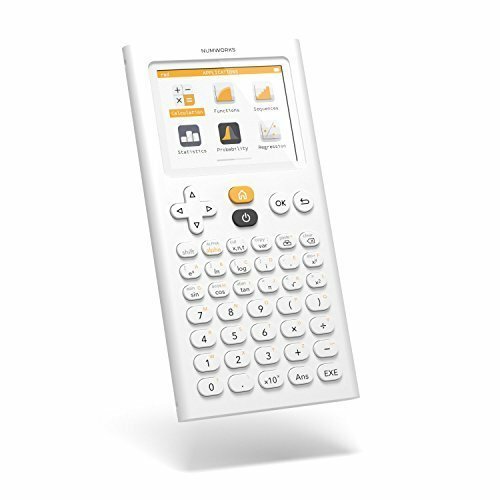 Ergonomic, open source and evolutive, the NumWorks graphing calculator is designed for today's needs with today's technologies. NumWorks makes learning maths easier for everyone: professors or students... and it perfectly suits the whole high school curriculum. Specifically designed for high school usage, the NumWorks graphing calculator is an innovative and elegant device, both in terms of looks and operation. The NumWorks calculator is rechargeable with a micro USB port and can last up to more than 20 hours in intensive use or multiple years in standby mode. Because we believe in education and collective intelligence, we're providing you with all our know-how and offer you to be part of the first collaborative calculator. The keyboard is divided in 3 thematic areas to provide you with the most convenient use: the navigational area that allows you to easily select a menu, the advanced functions area and the numerical keypad with well-separated keys to be used precisely and quickly. With its 6 tailor-made apps, you'll get straight to the answers. Its functionalities cover the whole high school curriculum and have been designed with teachers from the NumWorks community. If you have any questions about this product by NumWorks, contact us by completing and submitting the form below. If you are looking for a specif part number, please include it with your message.